If you are struggling to find a gift for the grown-up Disney fan in your life who seems to have everything already, we’ve got you covered. This extensive list covers a variety of Disney fans with excellent gift ranging in price so you’ll never be without the “perfect” gift to give them. 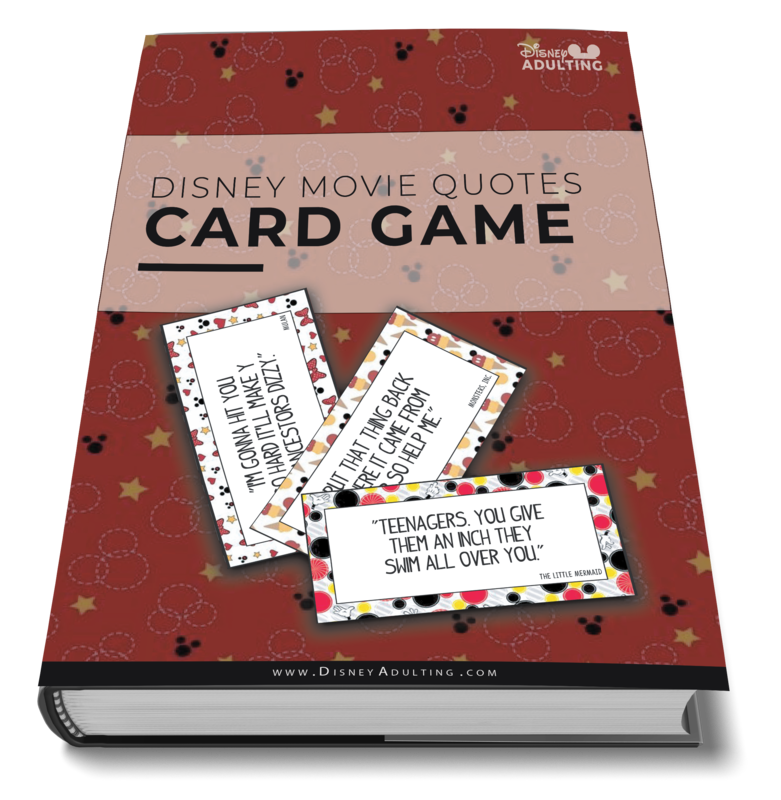 We’ll give options for up to eleven different types of gift categories that your adult Disney fan is certain to fall into at least one of them. The Foodie: The Disney fan who loves spending time in the kitchen, cooking with Disney cookbooks and trying out new recipes will delight at any of these gifts. Coffee Lover: A constant cup of coffee in their hand – hot or cold brew – this Disney fan will love these coffee-friendly Disney gifts. Fashionista: Always a style icon with some Disney flare, these gifts are perfect for the gal who loves Disney fashion. Bling-Bling: A little sparkle is just as good as pixie dust when you gift Disney jewelry to someone who loves Disney bling. Star Wars Fan: These gifts are ideal for the one who is with the force and the force is one with them. Electronics Geek: When you have all the gadgets, it’s easy to gift them Disney technology and accessories. Princess at Heart: If the crown fits, gift one of these “fit for a Princess” gifts to this Disney fan. Couch Potato: This Disney fan loves lounging around in pajamas, watching Disney movies and any of these great gifts. Marvel Fan: Any comic book fan who loves Iron Man, Spiderman and more will leap over these gifts. Frequent Flyer: For one who is constantly traveling or planning their next trip to the parks, these are gifts that are their kinda bag. Bag Lady: For the gal who has every purse imaginable, these Disney bags will complete her collection. Start your mornings off right with the help of everyone’s favorite mouse, Mickey! This Disney icon has jumped off the screen and into your kitchen to help create a slew of delicious, sweet treats the entire family can enjoy. This classic Mickey Mouse waffle iron makes one large Mickey head waffle and is perfect for any Disneyphile! Serve your favorite guests with a smile and our 24-Pc. Mickey Mouse Flatware Set. This fine stainless-steel utensil service for six features an elegant Mickey icon cut-out design. Mickey takes his own good time to make kitchen magic with this five-quart Slow Cooker and 20-ounce dipper for all your favorite crockery cooking recipes. Delight guests and family with our Mickey icon Dinnerware. This set of 6 dinner plates features a filigreed mouse icon glazed in the center. It’s the perfect complement to any Disney kitchen. Let Mickey lend a helping hand around the kitchen with his Best of Mickey Mouse Measuring Spoon Set. Four different spoon sizes dole out just the right amount of ”glove” for every beloved family recipe! Coffee Lover: A constant cup of coffee – hot or cold brew – this Disney fan will love these coffee-friendly Disney gifts. Want to know R2’s secret to making a great cup of coffee? Beep, beep, bloop, beep, whistle! Not a whole lot of help, huh? It’s all good. Just trust R2 to hook you up. This coffee press has an easy pour spout with a glass body, dishwasher safe parts, and takes less than five minutes to make the perfect cup! Clear the stars from your eyes after a spin around town with a fuel-up from this pair of matched WALL•E and EVE mugs featuring heart-shaped indentations, the perfect complement to computer dating! Wake up to a powerful punch every morning when using Cap’s single cup coffee maker. No waste, no fuss, just a fresh cup of coffee every time! Stitch dutifully warms your coffee in this detachable lid mug, completed with 3D sculpted detail, raised eye and nose accents, and high gloss finish – for a drinking experience that’s out of this world. Your self-contained waffle station includes a waffle maker, a melamine plate and placemat (in your choice of theme), the second set of flatware, a mug for your coffee, and a USB wall charger because there are never enough outlets in cramped spaces and you’re about to introduce another appliance. And you should never have to choose between charging your phone and waffles. Beautiful hand painted custom Vans designed to your specifications and painted by hand by a skilled artist. Minnie strikes gold on this soft and sporty knit sweater with long raglan sleeves, pouch pocket, french terry interior, and golden character art. Hit the streets with Mickey Mouse in Coach’s sleek and stylish low-top leather sneakers. Available in limited quantities, so better hurry! You’ll turn heads and create smiles in this adorable polka-dot dress inspired by everyone’s favorite sweetheart – Minnie Mouse. This classic style hoodie features everyone’s favorite sweetheart Minnie Mouse in her various character designs over the years. Soft and comfy, the hood sports Minnie ears and her signature bow. Classic style is yours when you don the iconic and on-trend Mickey Clips Collection by PANDORA featuring our famous mouse in sparkling style as well as elegant sterling silver Mickey bracelet. Mickey’s iconic image is formed from three diamond-encrusted swirls on this dazzling Mickey Mouse Necklace. The 18 karat gold setting and chain further enhance the sophisticated style of this necklace that sparkles with character. Their imagination can ride aboard the dazzling pumpkin that’s set within the necklace of this Cinderella Jewelry Set. Their roleplay fairytale can last beyond midnight as they transform themselves into the Disney Princess. Celebrate Walt Disney’s first, original Ingersoll Mickey Mouse Pocket Watch with this handsome replica from the company that started it all. Famed 1930’s design lets Mickey’s gloves do the time-telling. A hit then and now! The Star Wars: The Last Jedi Pin Collector Tin includes an enameled starter pin with the film title and printed display card with six additional spots for each pin in the collection, each sold separately. These elegant Star Wars Lightsaber grinders have a ceramic mechanism you can adjust from fine to coarse. These mills are made from stainless steel with durable plastic exteriors, molded to look like the iconic Jedi weapon. This is the droid you’ve been looking for! The app-enabled BB-8 droid by Sphero is equipped to explore the Star Wars galaxy by your side. Train your BB-8 with your smartphone, explore holographic simulations, interact with other droids and more! Step into action with the First Order Heavy Assault Walker. Fire the head-mounted spring-loaded shooters and take aim with the rapid-fire stud shooter on top. If the Resistance fighters get too close, drop the mines at the back. Exclusively Ours – Porgs are adorbs. Now you can take them with you, even on a classy cardigan. This lightweight, knit top has short sleeves and faux pearl button-up styling for a retro fit. Circle helps families manage online content and time across all your home’s connected devices. With Circle, you can filter content, limit screen time, set bedtimes, and even pause the Internet for every device in the home. You’ll have an extra set of ears on all your calls with this Minnie-shaped clip case for iPhone. Iconic mouse features form a contemporary art view of our leading lady. Spice up your commute with the Rickshaw 15″ MacBook sleeve! Made with water-resistant fabrics and an ultra-plush padded liner, this sleeve provides the ultimate level of protection while beautifully displaying custom artwork, designs, and text. Made from scratch in San Francisco with a focus on environmentally sustainable manufacturing, the Rickshaw 15″ MacBook/MacBook Pro sleeve is the perfect way to protect your device, without a style sacrifice. The Iron Man Mechanical Keyboard brings all the flair of Tony’s Avenger alter-ego to your campaign (or your work – it’s a keyboard, it’ll type a TPS report, too). Based on the Iron Man Mark XLIII armor design, this keyboard features exquisite workmanship from the metallic housing to the durable double color injected keycaps. And it lights up! The luminous multicolor effects are programmable and customizable, so you can back-light your way to victory. The cyan switch keyboard also features three levels of reaction rate control (2ms/4ms/8ms) and includes 12 multimedia function keys. Advanced enough that Tony could have designed it himself if he wasn’t so busy building more Iron Man suits. Star Wars First Edition On-Ear Headphones feature professionally-tuned, 40mm drivers which pump the tunes into your earballs with amazing clarity. They’ve got Quiescent PNC (Passive Noise Reduction) to cut out the background noise around you. And Star Wars First Edition On-Ear Headphones are very portable – folding up into their own carrying case. Star Wars First Edition On-Ear Headphones were created by infusing Star Wars goodness into STREET by 50™ Credit headphones – and they are ready to take your ears to a musical galaxy far, far away! You’ll be fairest of the mall when carrying our leather-trimmed Tassel Crossbody by Dooney & Bourke celebrating the 80th anniversary of Walt Disney’s masterwork Snow White and the Seven Dwarfs. It’s your dream bag, Princess. Beast takes Belle’s hand as he leads her on a dance beneath the stars in this romantic scene from Disney’s 1991 animated classic. This memorable moment has been captured in a variety of formats to enchant any home. Relive nostalgic days of Disney Classics on VHS tape with this softcover notebook journal featuring pre-lined and graphed pages, plus a glossy cover reproducing Aladdin clamshell case cover art. Cast a stylish spell when carrying this elegant crossbody bag by Danielle Nicole. Inspired by the glass sculpture from the animated classic Beauty and the Beast, the clear design houses an enchanted rose coin purse. You’ll want to stay in Fantasyland way past midnight wearing Cinderella’s enchanting ear hat, sparkling in sequins and crystalline gems, and topped with a satin bow. The curiously cute Porgs of Ahch-To island will be your companions as you sleep in this 100% cotton pajamas. Inspired by Star Wars: The Last Jedi, our two-piece set features an allover Porgs print and comfy jogger-style pants. Shut out the day’s worries and say ”Yoo Hoo!” to sweet dreams with this satin sleep mask inspired by Minnie Mouse. It even comes with its own faux leather, zip-up case. Mickey is looking like he just got woken up against his will on these soft, fun slippers. The foam-padded footbed will give you all the comfort you need as you make your way to bedtime. Slumber has never been so sinful until you slip into our super soft flannel Disney Villains sleep set by Munki Munki®, pajamas you’ll never want to take off! Dream of traveling the globe like Mickey and Minnie with this romantic short sleep set. The allover print of this long sleeve top and coordinating shorts features the sweethearts keeping in touch by mail while on vacation. Imagine summoning the powers of Mjolnir! Inspired by classic Thor and built at full-scale, this Legends Series Electronic Hammer features premium design and styling, as well as intricate detailing on the hammer’s pommel, straps, and hammerhead. Set to the all-new sonic backdrop of ”Awesome Mixtape #2,” Marvel’s Guardians of the Galaxy Vol. 2 continues the team’s adventures as they traverse the outer reaches of the cosmos to the tune of this soundtrack CD compilation. Warm up your webbing in this thick, traditional pullover knit sweater with woven Miles Morales Spider-Man uniform design, manufactured by Mighty Fine. You’ll be able to get dressed up knowing you’re in safe hands with these Spider-Man Mask Cufflinks. Finely detailed in metal, these sculpted fashion accessories will show off your Spidey sense of style. Rocket Raccoon will blast miles of smiles to passersby when placed on your dash or toy shelf. This fully sculptured Pop! Vinyl Bobble-Head Figure is inspired by Marvel’s Guardians of the Galaxy Vol. 2. Travel in smart style with this classic Minnie Mouse-inspired hardshell luggage bag from American Tourister! Minnie’s classic polka dots and signature bow make your precious cargo easy to locate, and spinner wheels ensure smooth transportation. Mickey will always be on hand to organize all your traveling documents with this Disney TAG pouch. Featuring compartments for your passport, boarding pass, etc., its cord can go over your shoulder, or around your waist for hands-free ease. You’ll enjoy traveling back in time with this vintage-style rolling luggage. Inspired by classic steamer trunks, this suitcase is designed to look well-traveled with printed worn labels from your favorite Disney Parks attractions. Take the funnies on all your fun trips with Mickey’s rolling luggage. This comic-stripped flight case is a cool carry-on for your travel essentials, with backpack straps plus retractable handle and wheels for a range of carry options. Ariel pleads her case that the world on land can’t be all bad. Her father Triton is not having it, but you can with this faux leather bag from the Disney Designer Collection. Fashionable and roomy, this bag can become part of your world. Mickey and Minnie will give you a hand carrying your essentials in this Satchel by Dooney & Bourke. It features an allover ”Best of Mickey” sketch design with iconic elements including glove and bow. This super cute crossbody bag by Loungefly gives Minnie a quilted leather-look with silvery mouse icon studs and a shiny vinyl bow appliqué to top the trending styles. Dark or light, keep your Imperial coins, cash, and cards at hand in our Star Wars character coin purse with Darth Vader’s embellished mask design decorated in Dia de los Muertos-style flourishes. Featuring Mickey’s iconic ears, Coach’s signature saddle bag is crafted from luxe leather for an unforgettable look. Available in limited quantities, so better hurry! What’s on your Disney wishlist? These are great ideas!!! Love it! Great ideas! I especially love all the accessories and jewelry! This post is AMAZINGLY comprehensive! I love how you broke everyone up into a “category” with gift ideas for each. I pretty much want everything.